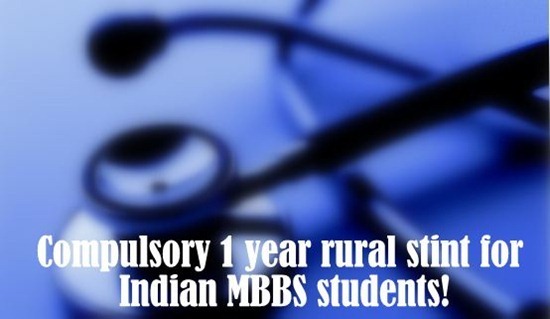 Compulsory 1 year rural stint for MBBS students: Good news or bad? Studying medicine in India has always been in the news for some reason or the other – whether it is about increasing seats, common entrance tests being introduced, government packages being announced for medical colleges or what not. This time around, the debate is regarding the duration of the currently 5½ year long MBBS course which is being increased to 6½ years due to a mandatory rural service component being introduced. As reported by TOI, Health Minister Ghulam Nabi Azad and the Medical Council of India (MCI) recently discussed the amendment of the MCI Act, which in simple terms means that all MBBS students will mandatorily have to undergo a year-long rural posting before they officially graduate to become doctors. 1 Why does the government want to implement this change? 5 What incentives has the government given to Indian MBBS doctors for rural service before? 6 Does this mean good or bad news for MBBS students in India? Why does the government want to implement this change? This proposal was first introduced by former health minister A Ramadoss in 2007, but failed to take off. The reason why this proposal is suddenly being revisited is because India is facing a shortage of human resources in health, especially in rural and tribal areas, where the population remains vulnerable due to lack of medical resources and medical professionals. 26% of Indian doctors live in rural areas providing services to 72% of the population. In contrast of this, the urban density of doctors ranged 4 four times to that in rural areas, and that of nurses ranged approximately 3 times higher. More than 34% of male health workers, 38% of radiographers, 16% of laboratory technicians, 31% of specialists, 20% of pharmacists and 17% of ANMs and 10% of doctors’ posts were lying vacant. This happened due to undue delay of recruitment of medical professionals. As per a Planning Commission study that TOI reported, there is a current shortage of 6 lakh doctors, 10 lakh nurses and 2 lakh dental surgeons. What incentives has the government given to Indian MBBS doctors for rural service before? As per the report by TOI, the health ministry has been continuously giving incentives for MBBS students to be an active part of providing their services in rural areas. According to these incentives, MBBS students who did one full year of rural service would be offered 10 marks as additional weightage. Those who completed 3 years in the backward and tribal areas would get 30 marks. 50% seats in PG diploma medical courses would be reserved for medical officers in government service who had served for at least 3 years in remote, tribal and difficult areas. MCI chairman Dr K K Talwar told TOI that unfortunately none of these benefits have paid off until now. This could be a major reason why rural service is being made mandatory. Does this mean good or bad news for MBBS students in India? It’s a clear division that this if this amendment is implemented successfully, it is going to spell good news for the Indian medical field with more and more medical services penetrating to the poorest of Indian regions. As Dr. Talwar noted, services of 40,000 MBBS students will be utilized for 1 year in the National Rural Health Mission if this proposal is cleared. For MBBS students though, this is a clear flood of bad news for very obvious reasons. Let’s take a quick snapshot. In the whole year of rural posting, students will earn exposure to rural and tribal lifestyles and therefore be exposed to unique medical case studies. More students entering rural areas will mean more facilities being generated by the government for accommodation, clinic set ups, medical equipment, services, drugs and so on. This will in effect bring more development in those areas. Students will not be paid as interns but as doctors during that extra year of rural posting. Currently, in order to fill in the compulsory short term requirement of the rural services component, MBBS students are generally known to create fake papers, bribe rural representatives who fill in false attendance for students and so on. Fake entries, bureaucracy and bribery in this area will decrease if rural services are made compulsory. India will be at par with the norms of many other countries overseas such as Australia, where a compulsory component of rural service is to be completed before the student can graduate as a doctor. The most obvious flipside for any MBBS student is going to be the herculean increase in the duration of the program. The Asian Age reported the sentiments of a few doctors on this issue. The current MBBS course is 5.5 years for MBBS, add 3 years of PG and then 3 more years for super specialization. This way, the total duration of study for becoming a doctor would come to almost 11.5 years. If the amenities and facilities for MBBS students to work and stay in rural and tribal areas are not set up reasonably well or if the environment for them to dispatch their services is not congenial due to whatever reason, there may an outrage in student community for adding a wasteful year in the already long and arduous coursework. Let’s see what 2012 brings for all MBBS students in India. What do you think? "Compulsory 1 year rural stint for MBBS students: Good news or bad? ", 5 out of 5 based on 1 ratings. The article says 11.5 yrs to be come a doctor, preparation for PG and super specialization will eat away at least 2yrs each, that adds 4yrs more…. beneficial for both govenment and fresher. FIRST THE CENTRAL GOVT STATE GOVTS NEED TO SPELL OUT WHAT BASIC ARRANGEMENTS ARE MADE IN RURAL CLINICS TO SERVE THE PATIENTS. WHETHER EXISTING PHCs ARE PROVIDED WITH ALL THE MEDICAL INFRASTRUCTURE AND SUFFICIENT MEDICINS TO TREAT. WHETHER. BASIC NEED OF 24 HOUR ELECTRICITY AND WATER IS ARRANGED? WHETHER SUFFICIENT NUMBER OF NURSES AND TECHNICIANS POSTED? LET THE GOVT COLLECT FEED BACK FROM JUNIOR DOCTORS WORKED THERE ABOUT THE POSITION AND AND SUGGESTIONS FIRST. FEED BACK BY RURAL WORKED INTERNS BE MADE COMPULSORY AND PLACE IT BEFORE THE MCI, MINISTRY AND OTHER CONCERNED. THEN ACT ON IT. has anyone been to a rural phc,it is easy for you to sit in front of your computers and type but the difficulties faced to the doctor and his family are enormous. 1.security provided?especially for female doctors? 2.basic ameneties?most of the places dont have electricity,telephone,cellphone signal,water or proper sewerage. 5.right to work? and freedom of choice?the most important factor-‘human rights’..we have completed our prescribed education wit the compulsary internship,and after we graduate,ordering us to work without our free will is infringement of our human rights..after all we are also human..we can choose where,what and when to work. This is an armchair and arbitrary thinking. As rigtly elaborated above by Dr. Kishore Kumar the Government doesnt seem to have an idea how gruesome ( and this is not just merit case) it is to become a doctor. Fears Competition, unending volumes of books, huge huge money, never ending pursut for speciality ( and this is a compulsion), the reservation issue ( where lives are endangered ..sick), teen years lost in studies,filthy government hospital conditions and the mental agony of the entire family and last but not the least uncertainty on pursueing good life becasue of huge financial stakes and other social and psychological issues. Not surprisingly not many are too eager to join the profession. A governmetn which is not maintaining even a decent standard of health facilities at hospitals is up to crucify doctors? To day also almost all do not adhere to the bond for same reason. Does govt guarantee decent living, ambience, medical facilities , support staff and infrastructure in rural areas? Govt already exploits doctors by paying meagre stipend and getting them work 24×7 in most unhygenic conditions. Why are these doctors not human and have no social life or values? We know the position of RuralHealth and Primary Education Centres. Then they talk @ additional mark as incentives. Which means govt is compromising on quality and playing with safety of patients as is doing in reservation. Its sure a recipe for dwindling medical profession which already is facing serious void. Instead of seriously thinking on remedial measures govt is becoming short sighted, unimaginary , arbitrary and escaping its responsibilities by putting guns on meritorious scarce folks of medical fraternity. IT IS A GOOD MOVE.POOR RURAL PEOPLE WILL BE BENEFITED.MCI SHOULD NOT BACKTRACK OF MEDICAL STUDENTS STRIKE. Appointment of Doctors for Rural Healthcare. The present idea of the Health Ministry of Government of India to extend MBBS course by one more year and post them in rural Health Centres for one year is hare-brained and least to say is stupid and absurd, for the following reasons. After completion of medical studies, no one is competent enough to practise without the help and supervision of senior doctors. At that junior most level, they do depend on a great deal of laboratory and medical imaging services to make proper diagnosis and treatment. These facilities are grossly inadequate at the rural level. All that the Government is achieving is to sacrifice the poor and ignorant villagers as “guinea pigs" for future medical practitioners and possibly as a population control measure. Furthermore, the young doctors are looking for more experience before they start on their own practise. It is the time for them to get married and enjoy life after five and half years of gruel and hard work and study to pass MBBS. It will be a sadistic policy for the Health Ministry to impose this punitive posting for these young budding doctors to be imposed on the ignorant and poor rural flocks. Will all the elected members of the Government at all levels, High Court and above Judiciary and all first class civil servants at all levels will be submitting themselves and their family for their medical care to these junior doctors and only junior doctors for their medical needs? As an alternative, viable, useful, more humanitarian, compassionate and effectual alternative is to appoint all those doctors, nurses and paramedical staff in service after they attain the age of fifty+ years to be posted to rural areas and allow them to be in service up to the age of 75 years. In today's lifespan, it is possible for one to work up to the age of 75 and almost all doctors do work to that age anyway. Give them 50% additional salary for rural postings. The rural people will have confidence in such experienced medical persons and in all likelihood, a doctor continuously working in same rural area will know the persons health need and will be in a position to give the best medical care. It is imperative that these doctors should not be transferred and should remain in same area for the duration of their service. The cost will also be much less than a young and fresh doctor’s treatment. THE GOVERNMENT WANTS TO INCREASE THE NUMBER OF UG SEATS. THE GOVERNMENT WANTS TO INCREASE THE DURATION OF THE COURSE. WE REALLY NEED TO LET THE PEOPLE KNOW WHAT THE GOVERNMENT REALLY WANTS TO DO. First try giving jobs to the doctors' posts in your department that are vacant. Try increasing the seats for post graduation to bridge the UG:PG gap. Try understanding the fact that increasing the UG seats is not the answer to the health woes of our state. Try stopping to fill your pockets with the money sanctioned for the people. For every PG seat in the state there are more than 500 contenders and that should be a shame to you. A post graduation should be a transition and not a rat race. A seat should be based on merit on not deep pockets. Try to introspect on what the real need of the hour is and it is definitely not an increase in the MBBS seats. They will pass out and get into the race for PG and you won't have one doctor coming out to actually work. At the all India level you have 70000 doctors for a mere 4000 seats and at our state a mere 500 seats for the 9000 doctors writing thus having a backlog of about 90% every year with new students being added every single year. Who ever is planning these increments is doing just so that the demand remains high and so does the price for PG seats (2005 – 90lac for radio; 2012 1.7 cr for radio). A pity! So bad is the race that doctors don't have the time to come out and protest for the lack of even a single day to put into this away from the PG preparation. It might look all rosy and colorful to have a "Dr" tag but when it comes down to sitting for 14 -16 hrs a day to prepare with no guarantee what so ever of actually getting what you want, the real picture begins to show. How do you do it? Its simple really. Just increase the Doctor:PG ratio which currently stands at 2. Honestly there isn't much that's going to differ in terms of the quality if you increase it to 1:3 or 1:4 (Doctor:PG). Yet its not been done why? Because that would increase the seats by 4 times the present number and that would mean a drop of prices all around. How would our dear politico's let that happen considering that they own most of the medical colleges in India. Another viable option is to simply raise the existing number of seats offered for a medical college. It is just so simple. A college can hold 200-250 students yes but when it comes to the number of PG seats granted to the same college then it a SHOCKER(Please do the research). Another simple option is to just scrap the 2 year Diploma seats and convert them to Masters because honestly this is another blinder by our government to keep us in the dark. There is practically no difference in the way they are coached other than the one year lesser duration and the difference in salaries that they receive once they are done. Then why have such a course in the first place? Because in the government service it costs 40000 to maintain a diploma and 70000 for a masters candidate. WAKE UP PEOPLE! FOR WE'RE APPROACHING A DAY WHEN THERE WILL BE MONEYBAGS TREATING YOU AND THEN YOU WON'T LIVE TO TELL THE TALE! Do we designers see any opportunity here? Oh yes! The rural population is all about you designers! I think this is a great move, just one sentence sums up the need "26% Doctors for 72% of the population".